In the Hindu mind (and in ancient India), a trip to Kashi - holy Benaras - is the ultimate pilgrimage. 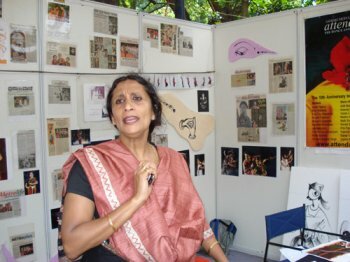 In modern Bangalore, Kashi means Vyjayanthi, and for two days she became a travel- agent and organizer to all who were willing to go on this yatra of dance! This dusky beauty of Kuchipudi organized the two-day event on Oct. 4th and 5th, with just a handful of students and loads of goodwill. In doing so, she created India’s first dance-fair. 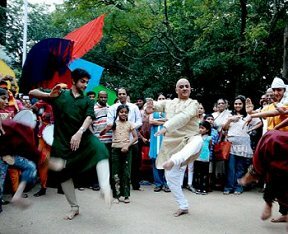 This itself is a unique initiative that would help general public come closer to dance. 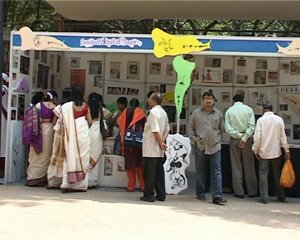 The crowds at the Chitra Kala Parishad, Bangalore’s best known cultural address and space, showed she had come up with a winner idea. In fact, her Jathre has the potential of becoming what Nrityagram’s abandoned festival Vasanta Habba used to be. Only, bigger, longer (two full days, morning to night) and more interactive. The idea is novel because while there are dance festivals and seminars, there is no platform where dancers can exhibit their wares, literally. By wares I mean, costumes, jewellery, write-ups, banners, school-profiles, classes, fees, curriculum, posters, masks, books, journals, even visiting cards! Before attending, I had mused what would one put in a stall? 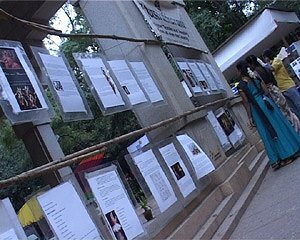 Seeing the range of posters, press-clips, videos, promotional material and students searching for best courses and teachers, it came through that it almost became also a dance-education fair. All beginnings are humble and it is best that way! 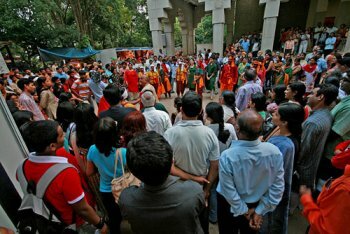 Kashi and company have tried to give Bangalore a new dance initiative and for that alone they stand congratulated. She included and invited all gurus and most were there lighting the lamp at the inaugural and other events: Guru Lalitha Srinivasan, Guru Bhanumati, Guru Radha Shridhar, Guru Revathi…..the Kathak and contemporary lot strangely stayed away! It seems, while Shambhavi invited all, some local dancers perceived her initiative to be pay-for-stall and display your dance pitch unpalatable, but then somebody has got to pay the bills! Originally, the Jathre was mooted and slated for April but maybe Kashi’s tour of the Middle - East clashed with organizational details, or enough ground-work and popular appeal could not be mustered in that short time. October is a better month anyway for outdoor events in most cities, especially Bangalore. The idea was to give stalls to individuals, institutions, agents, gurus, bookshops, costume-makers and let the public, the general, non-dance public see for themselves what dance has to offer. As all good intentions translate on ground in India, the first day had a little late start (rahu kalam!) but soon gathered momentum with enthusiastic participants showcasing their talents. There were dance, painting, essay competitions, space for youngsters to show their dance art and generally for the common public to see and exchange dance news and views. 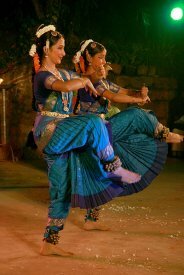 Bangalore is a unique place for dance. There is little jealousy (evident one! ); little politics and little opportunities! Thus, any event gets good crowd and involved audiences. While this makes the organizers task somewhat easier, it is not entirely without its pitfalls. One such in evidence was lack of quality-check for evening, main performers. Two substandard Orissi dancers – one round, huffing-puffing for breath type (having come from USA was her only qualifying trait!) and two reed-thin, starved-looking Oriyas from back of beyond with bad postures and worse dance ability (why couldn’t the local Orissi dancers, Uday Shetty, Sharmila Mukherjee and Vani Madhav be showcased? ); one banal contemporary take on Hiroshima and wars (meant more for impressing seminars and conferences in international circuits, using disadvantaged children by one John Devaraj of Cochin) and some local, rustic Karnataka folk dances done routinely (one male dancer kept smiling in all the items, including in the navarasas! (nine moods/sentiments) and another didn’t know steps and looked to others to copy on stage; two girls looking lost in urban jungle and one failed to attire properly and so on.) The concluding day events became too long and haphazard. An evening should grow in artistic sense, strength to strength and not become lame or boring towards the end. 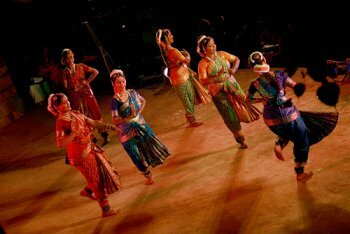 What stood out were Guru Bhanumati’s first-rate Bharatanatyam group choreography set to both traditional and rap music; all her dancers are uniformly good and well trained and she selects perfectly synchronized patterns that do justice to her name and standing as an excellent choreographer. Nirupama-Rajendra were globe-trotting but their group Abhinava’s taut Kathak item (the first one hardly had much component of Kathak) would be perfect item for a Bollywood Award Nite type-of-shows --- all glitter and jazzy. Though, one must say their tayari was excellent and clearly the duo - despite travels and tours - teach well. Anuradha Vikrant, that doer-of-Drishti (a local magazine on performing arts) and dancer-actress showcased her students and they acquitted well as did Deepak Mazumdar with his student Pavitra. Deepak, for those who don’t know, was Bharatanatyam’s most gifted male dancer a decade and a half ago but lost pace due to poor patronage and support systems, forever a problem area for dancers but more so for male dancers. His student Pavitra has a rather arrogant/angry stage presence, trying to over-reach himself. They were enacting Puarandaradasa’s madhuram bhakti with Krishna as the anchor. Horrible props (that Krishna clay-statue would put any Krishna devotee to shame!) did nothing to help. Princess (in real life) of Mohiniattam, Gopika Varma’s dance was like gentle breeze, languorous and sensitive. She was a soloist with depth and drama. Her group had an uneven quality about it. An eye on quality will help future jathres. This is not an easy task but dancers need editors to help see what works and what is too long. While a jathre like this is by definition open to all and inclusive, yet in order to help the cause of dance, some screening ought to be done, especially for evening performances where crowds are large. One does not win new audiences by showing substandard art. More than the dance performances, the actual idea of Dance Jathre, needs to be celebrated. One, it brings many disparate elements together: on stage and off stage. It gives a rare opportunity for all to savour dance art. It makes for a good weekend festive occasion (parking remained a casualty; while one foreign delegate lost her passport due to carelessness of volunteers who just left her bag unattended, this critic had to leave first day’s performance midway to save his car from being towed away because there was no parking!). Parking remains a major issue in Bangalore because most halls (except for Chowdiah and Ravindra Kalaskhetra) have planned no parking for the public. Barely 10 cars fit in CKP and then the rude guards close the gates. This is a major deterrent to those having cars but no drivers. Now, with increased traffic, visitors need to be able to park somewhere! The CKP is a huge piece of land, badly under-utilised and there is ample space for making parking space at back and on side but no, who wants to bother? True, an institution cannot be responsible for many cars but atleast use available land for maximum parking possibility. Noted absentees were well-known gurus and their institutions like Natya Institute; Nrityagram (they are never in India is the general refrain!) and those dance poseurs - the Nrutyarutya group (all N’s!). Hordes of others individual, active dancers also were not seen either because of time schedules or disinterest. 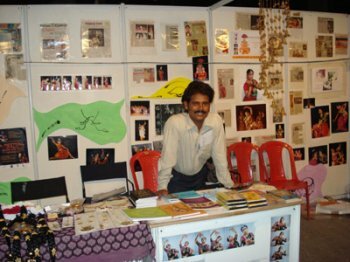 While stall-buying may have stalled their participation, the point is: dance needs all support, especially in a city like Bangalore, so all such occasions should be enhanced in the interest of the art. The enhancers were Canara Bank, CKP (Chitra Kala Parsihad as venue and what a splendid setting it is for all art activity), Nagpur based South-Central Zone Cultural Centre (what culture is there in Nagpur except for narangis as in oranges but that’s a fruit! Even Vijayawada boasts of more culture, in the same zone) and of course the Dept. for Kannada and Culture. 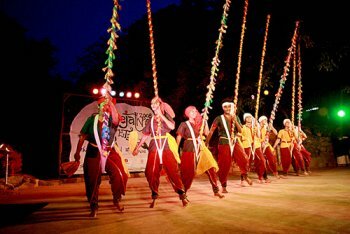 Kashi and company hope to enlarge the scope next year to 3 days and in 8 years, to nine days, to coincide with the Navaratri-s, festive occasion of nine nights…dance yatra has begun and dance jathre is born! 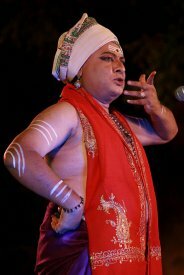 Ashish Mohan Khokar , reputed dance-critic and historian; editor-publisher of India’s only yearbook on dance - attendance - and author of over 30 books on Indian dance and spirituality, now lives in Bangalore and occasionally plans to platform Bangalore events that make a mark or make a difference.